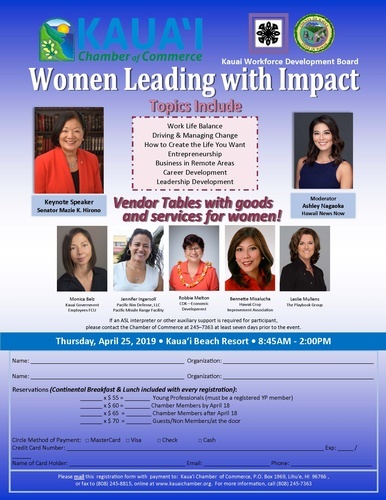 Members Services Committee in partnership with the County of Kauai's Economic Development Board, presents the Women Leading with Impact symposium featuring keynote speaker, Senator Mazie K. Hirono. In addition to that we will be having an amazing diverse group of women panelists, including Monica Belz, Jennifer Ingersoll, Robbie Melton, Bennette Misalucha, and Leslie Mullens. Kauai's very own Ashley Nagaoka of Hawaii News Now will be moderating the panel. Following the panel session, we will break up into smaller groups to talk about specific topics. The five panelists plus Patrick Powaser and Mark Perriello will be leading these breakout sessions. Continental breakfast and lunch will be included in each registration.